Hyperion Power Generation, Inc. is a privately held corporation formed to construct and sell several designs of relatively small (70 MW thermal, 25 MW electric) nuclear reactors, which they claim will be modular, inexpensive, inherently safe, and proliferation-resistant. According to news coverage, these reactors could be used for heat generation, production of electricity, and other purposes, including desalinization. Hyperion announced in November 2009 that, despite their continued intentions to pursue the self-moderated uranium hydride reactor, urgent customer needs for a rapidly licenseable and deployable reactor are causing them to choose another LANL design for initial commercialization. They are moving forward with a more conventional Generation IV reactor design: a uranium nitride fueled, lead-bismuth cooled reactor. 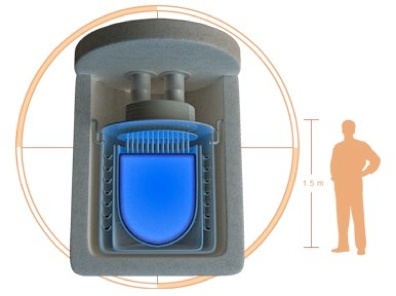 Using a liquid-metal-cooled fast reactor should speed the time to commercialization over the more revolutionary uranium hydride, self-modulating design that had previously been publicly discussed. As of November 2009, no uranium nitride fuel for the design has been tested or manufactured for the project, but Hyperion claims that fuel burns will begin before year-end 2009. As of September 2010, the company announced an agreement with Savannah River Nuclear Solutions, operator of the Savannah River National Laboratory in Aiken, South Carolina, for the development of a demonstration site, intended for testing and licensing purposes, at Savannah River.